Macclesfield Town Football Club made headlines on Wednesday when they offered to let a fan play with the team during a game for 10 minutes -for a £20,000 payment. A Radio Five Live caller suggested that Chris Evans, the Radio 2 presenter, could easily afford that to play on "the best pitch in the Conference National League". And leading Maccesfield businessman Richard Campey, managing director of Campey Turf Care Systems, agrees. "This is a superb pitch and anyone who played on it would see just how excellent it is - and Chris Evans would find it money well spent for the privilege of kicking a ball on this fantastic turf." Now embedded in the Conference National League, Macclesfield face a difficult new season with times financially tough for them. To maximize the limited football club funds available, Dave Towns - director of grounds at Macclesfield - decided to try the new version of the Koro Recycling Dresser, distributed by Richard Campey. "What an incredible piece of equipment," he says. " By recycling material already contained within the pitch surface, we were able to de-compact, aerate and then create and spread 80 tonnes of our sand rootzone." Dave continued: "This machine has saved us hundreds of pounds and all in one operation, we have not had to purchase and transport any sand, we have not had to load it and spread it - this was all carried out by the Koro Recycling Dresser in five hours." Final levelling was achieved by the Koro Speed Harrows, a very fast and accurate operation, preparing the surface for overseeding with the Vredo Supa Compact seeder in two directions. Richard Campey is delighted with progress so far: "The whole renovation was carried out in two days despite appalling weather conditions. 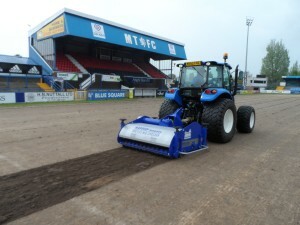 By the first match on July 23 Macclesfield Town will have one of the best playing surfaces in the North West of the UK." A seriously wet winter resulted in a tremendous build-up of poa annua (annual meadow grass) leaving an uneven soggy playing surface. The solution came in the form of a complete renovation using the latest equipment and techniques from Macclesfield based Machinery importer and distributor, Campey Turf Care Systems. "The whole pitch surface was removed with the Koro Field TopMaker (FTM) fitted with the new Terraplane rotor" said Dave. "This is a fantastic machine, and we are really impressed with how it works." The Terraplaning was followed with final surface hygiene pass with an Imants Rotosweep. This highly efficient sweeper ensures perfect clean up with its unique double brush collector system - giving 100per cent clean-up of all debris. Campey Turf Care Systems is one of Europe's largest independent grounds care machinery suppliers. 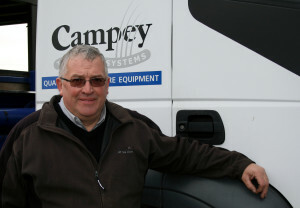 Over the years Campeys have earned a reputation for offering practical advice and superb aftercare service.